Got any 220s? Those should work just as well. 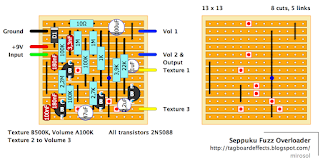 The schematic shows a 100n cap from the second transistor's base to ground but I don't see it on the layout. Thanks. Fixed. Rather crudely, but fixed. I have some very small 100n ceramics that would be perfect, so not crude in my book. I've built this and it works. Sounds great. Quite extreme. What the diode in this one? You don't really need it, per se, but it's like having insurance. Try 1N5817 or any 1N4001/4007 should work. The only downside to using it is it drops your voltage slightly which may or may not have an audible effect from circuit to circuit. 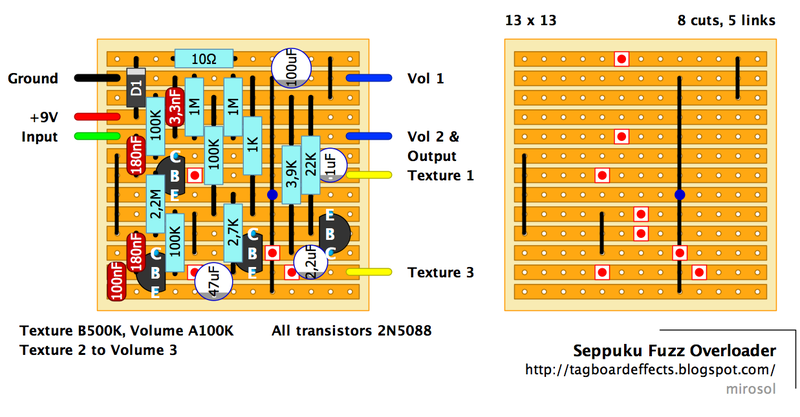 If you're breadboarding this ahead of time try it with and without. Forgot to note it, but 1N5817 is the way to go. Low voltage drop. Every single pedal in the world will receive the "i'm just trying this power adapter quickly to see if it works with this pedal" treatment at one point of their life as 99,9% of the population are stupid (me included). Thus, the negative effects of having ~0,2V drop in supply voltage vs. the semiconductors burning out with reverse polarity - in my mind, at least, the former will outweight the latter easily. The parallel protection is even more of a joke. Unless it's done with polyfuse and proper current limiter.. Enjoying this one. Its a bit like a darker version of the Maestro Super Fuzz. Some nice octaves. Sounds great with bass as well. Thanks Miro. My god, I love the insane filthiness of this circuit! I wonder if there's a way to get it silent when you let go of the strings, like a Superfuzz... Any ideas? Sounds great, but I get a fairly sudden volume drop shortly after beginning to rotate the Texture pot clockwise. As I continue to rotate it the volume increases till it's much louder than it was in the original CCW position. Hmm, this isn't normal is it? Doesn't appear so according to the video.